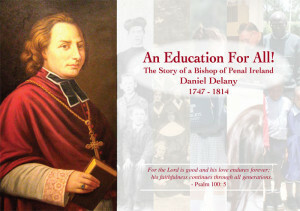 The bicentenary of the death of Bishop Daniel Delany is being celebrated in Mountrath, Co Laois and Tullow, Co Carlow this week. The bishop, who was born in Paddock near Mountrath in 1747, received his early education in a hedge school. During those penal times he had to sail to France to study for the priesthood. He later became a bishop and founded the Patrician Brothers and also restored the Brigidine Sisters. The commemoration began yesterday (8 July) with a visit to Bishop Delany’s homestead at Paddock where music was provided by the local Camross Comhaltas and prayers were said. “Heaven and earth were very close at Paddock today,” Sr Rita Minehan, a Brigidine Sister said in her welcome to all at the Thanksgiving Mass which followed in St Fintan’s Church, Mountrath. She welcomed in particular, Bishop Denis Nulty of Kildare and Leighlin, as well as the congregational leader of the Brigidine Sisters, Sr Louise Cleary, who had travelled from Australia for the celebrations and Jerome Ellens, congregational leader of the Patricians, who travelled from India. Sr Rita Minehan also welcomed all the Sisters and Brothers from Ireland and abroad as well as past pupils, parishioners and friends. In his homily, Bishop Nulty spoke about the need to look back at a figure from history like Bishop Daniel Delany. “I think it is very important to look back, so we can live with greater courage and conviction,” he said. “Today we should ask ourselves how well we are living up to our mission,” Bishop Nulty challenges. Sr Mary Teresa Cullen, formerly of Tipperary and now in Texas in the US, told the story of Bishop Delany and how his first church, which was built on the site of the current church in Mountrath, was known as “Delany’s Folly”. She explained how he was not afraid to try something and fail, and that failure would spur him on. “He was a person of great moral courage and did not allow himself to be crippled by fear, and there was a lot to fear back then (in penal times),” she observed. When the Bishop was in Tullow, Co Carlow, he would ring the Angelus bell contrary to the laws of the time; likewise he revived the Eucharistic Procession. The religious orders he set up went to all the continents of the world and his legacy has lived on for two centuries in the congregations, pupils and friends of the Brigidines and Patricians all over the world. “We, like Daniel, continue to struggle for a more just society and his dream for a better world based on love,” said Sr Mary Teresa. She urged all present to keep his legacy alive and to pass it on to future generations. The celebrations continue today (Wednesday 9 July) in Tullow, Co Carlow. See: www.kandle.ie for details.